How to Search West Bengal Land Records Information in WB Registration website i.e wbregistration.gov.in….. The government of West Bengal has also not been left behind when it comes to the use of modern technology and online platforms. Citizens of West Bengal can now get all related services from WB Registration website that is operated by the Government of West Bengal. With the computerization of Registration services comes the benefit of improved services to the citizens as they are now user friendly and quicker. Initially, people would have to travel long distances in order to access the Registration offices and hence get the services that they are looking for. This long trips proved to be costly since one had to incur transport costs to and from the registration offices. Expenses spent might sometimes be wasted since a person may arrive at the offices during late hours when they have already been closed. The introduction of WB Registration website has eased the cost of doing things since a person can access it at any particular time that they term appropriate from the comfort of their house. Any information which you may need is readily available so long as you have an account with the website. 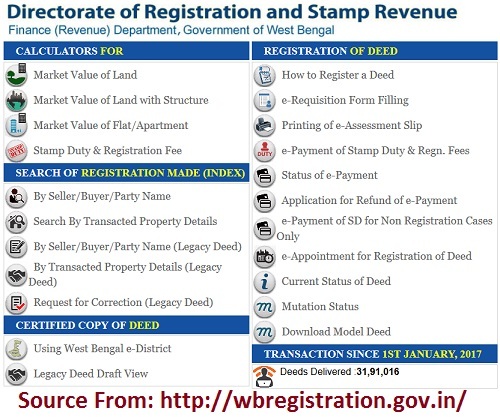 Registration of title deeds by land owners residing in West Bengal. This option is further divided into subsections that guide you on how to register a deed, apply for a refund in e-payment, check the current status of a deed and download a model of the deed. A person can also search for a registration that is made under the sellers, buyers or party name. It is also possible to know the market value of land from this website. On your browser, click on http://wbregistration.gov.inas the link of WB Registration website. This action will automatically take you to the official page of WB Registration. On the homepage of this website, select ‘By Seller/Buyer/Part Name’ option from the Search of Registration Made (Index) tab. This action will automatically redirect you to a different page of the site. In the new page, correctly fill in the details required such as first name, last name and the year. After filling all the credentials needed, click on display button after which you will see a full list of registration made by buyer, seller and party name. If every detail is correct, you have the option of printing it out for future reference. On your browser whether Google Chrome, Mozilla Firefox or Internet Explorer type in http://wbregistration.gov.in as the link for accessing the official page of WB Registration. On the homepage of the website, click on ‘Search by Transacted Property Details’ option from the Search of Registration Made (Index) tab. This action will automatically redirect you to a different page of the site. In the new page that appears, correctly fill all the details required. These details include property district, local body, the district of registration, property Thana and year. Once all the details have been correctly filled, select the option that you wish to use i.e. Road Wise Search or Mouza Wise Search. Confirm all the details that you have just entered and click on ‘Display’ to complete the process. You can opt to print the details if you wish to use it on a later date. Displaying the market value of land has never been the same thanks to the introduction of WB Registration website. Now everyone can carry out this task online within a few minutes so long as you have a fast internet connection. The steps below can help you in displaying the market value of land in http://wbregistration.gov.in Website. On your browser, enter http://wbregistration.gov.in as the link to the official WB Registration website. In the new page that appears, correctly fill in the details required. These details include; phone number, district, Thana, Khatian number and road zone. Now choose the proposed land use, area of land, nature of the land and any other additional information concerning land. Confirm whether all the details are correctly keyed in before you click on ‘Display’. You will now be able to see all the information regarding the market value of land. You have the option of printing the market value of land if you wish to use it on a later date.